Add neat borders with Memory Maker! You may have heard of Disney's PhotoPass that has been around for a number of years. 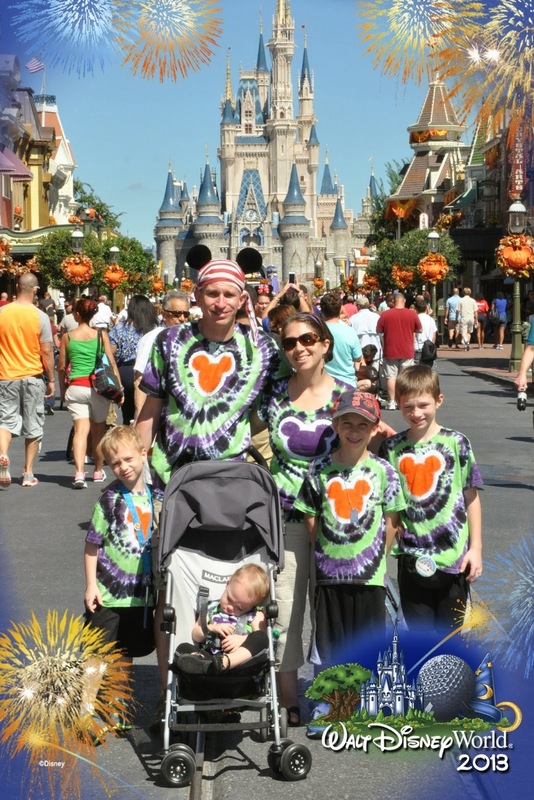 In 2012, Disney launched PhotoPass +, and as of December 2013, PhotoPass+ is now known as "Memory Maker". Memory Maker is a photo package where you purchase the digital rights to all your vacation photos! PhotoPass is basically a service where Disney has photographers stationed at different locations throughout the parks who will take your photo for you. The PhotoPass photographers are Cast Members with varying degrees of photography skills. While some may indeed be professional or semi-professional photographers, many are just friendly Cast Members who are trained how to use their fancy DSLR camera. How do I get my photo taken by PhotoPass? When you see a PhotoPass photographer, you can get in their line to have your photo taken (if there is one). They will often guide you in how to stand, smile and even make silly poses! You can also ask them to take a photo with your own camera. There is no charge to do this, and they will happily oblige. This is a great and inexpensive way to get a few good photos of your entire family! Once your quick photo shoot is done, the photographer will need to scan your photo information onto a your Magic Band or your Memory Maker/PhotoPass card. If you are staying off property, you will need a card. If this if your first PhotoPass photo, and you do not already have a card, or if you can't seem to find it at exactly that moment, the photographer should have a handy stack of them. I recommend taking a photo of the back of the card in case you lose it. You can link multiple cards up to your account. While most of these PhotoPass cards are a standard basic card, you may occasionally run across a photographer with a special card! 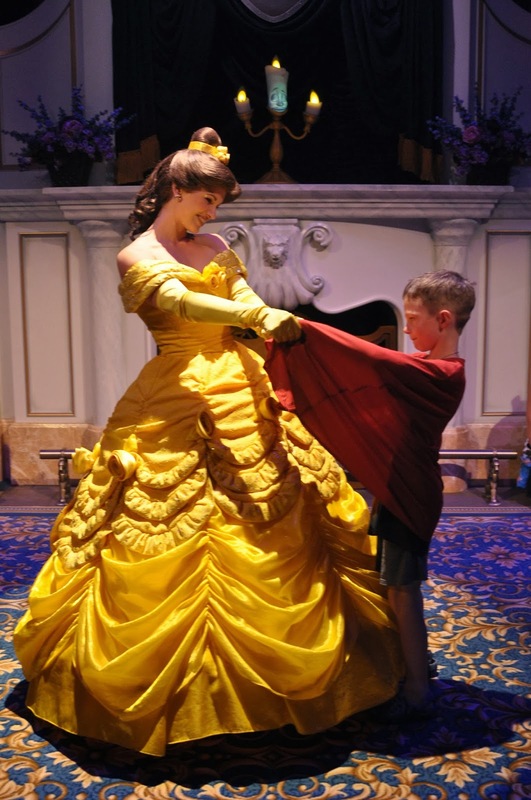 For example at Mickey's Not So Scary Halloween Party, or at Enchanted Tales with Belle, specialty cards may be found. These can be fun to collect too. Now, with Memory Maker and Magic Bands, if you are staying on property you simply have the photographer scan your Magic Band and you are ready to go! If you are off property and do not have a Magic Band, every so often, or even at the end of your vacation, you'll want to take your Memory Maker/PhotoPass card(s) to one of the PhotoPass Centers in the parks to view your photos and to have them added to your account. You can also do this on the computer when you return home, but I think it is easier to do it periodically in the parks. You can even upload your own digital photos from your camera to the same account, so everything is in one place. Memory Maker now has the option to upload photos from your Facebook account (if you are sharing mobile photos on your vacation) to your Memory Maker account. These features are valuable if you are going to use these different photo forms to make a Disney Photo Book, or calender or if you just want the convenience of all your photos in one location. If you are staying at a Disney Resort and therefore have a Magic Band and a My Disney Experience online account, there is no need to visit the PhotoPass Center to link your photos, though you may want to stop by to view them, or to double check and make sure everything has linked properly. Until the roll out of the Magic Bands is complete and all the kinks worked out, I think it would probably be a good idea just to double check your PhotoPass account occasionally during the trip to ensure no photos were lost. If there are photos missing and you know approximately when and where they were taken Disney can often find them for you! If you do not want to purchase Memory Maker, you can purchase individual prints from the PhotoPass Centers to be printed while you wait. If you are only wanting a single copy of that one special family photo, this is probably the best option for you. Prices vary based on the size of the print, but they are in the $15-$30 range. If you know you will be planning on purchasing several prints, pre-ordering Memory Maker may be worth it for your family. If you pre-order, it is currently priced at $149. You do need to pre-order your voucher at least 3 days in advance if you wish to include all your vacation photos. If you wait until you get to the parks to decide you want Memory Maker, you will pay the full price of $199. Don't think because Memory Maker is digital you can fool Disney, and hop online the first night of your trip and add the pre-order price. Photos taken within three days of the Memory Maker purchase will NOT be included if you purchase it online via the "pre-order" link. You will need to purchase in park and pay the full $199 to get all your photos. How do I make sure we get all of our photos? When you purchase Memory Maker you will receive a code number that you will need to link to your Magic Bands in My Disney Experience. Once it is connected, everyone in your linked party can add photos to the account with their own Magic Band! This is great for larger families. If you are separated in the parks, you can each continue to add your photos to your account wherever you may be! So if my brother and his family are getting photos of my niece at Bibbiti Bobbiti Boutique, and we are on Space Mountain, we can both add our photos at the same time. Part of the new next generation technology in the parks with your Magic Bands, is that hopefully in the near future, you won't even have to remember to add your on-ride photos. The new My Magic + system will recognize your Magic Bands as you ride the attraction and your photos will be added automagically! 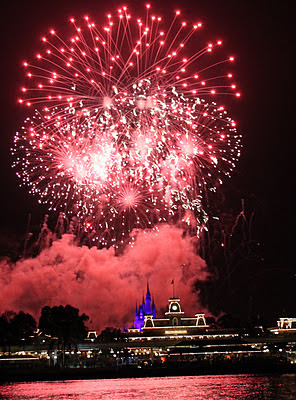 Just be sure when planning your vacation in My Disney Experience to link up to everyone in your travel party so that all the photos will be linked as well. Currently, you do have to stop after the ride and have it added to your Magic Band. So until further notice, be sure to stop and manually add your photos to Memory Maker. If you are off-property and using Memory Maker without a Magic Band, you will receive a voucher. Once you arrive at Walt Disney World you will need to take the voucher to a PhotoPass Center to exchange the voucher for the Memory Maker RFID (Radio Frequency Identification) card. There are PhotoPass Centers at each of the theme parks and several of the deluxe level resorts. While you can add regular in-park photos to your account easily by linking any basic PhotoPass card to your Memory Maker account, on-ride photos and meal photos MUST be added directly to the special card. The card is not sensitive enough to be picked up automagically while you are on the rides, so you will need to have it added manually by a cast member as you exit the ride. If you do not have your card after getting off a ride, (maybe you left it with the hubby like I always forget I have done) write down the number, and the Cast Member can usually add the photo to your account for up to 24 hours. Daddy trying to beat DS5 despite a cranky baby girl, in this on-ride photo. So what exactly does your $149 get you? You will receive a digitally downloadable copy of each of your vacation photos and the rights to copy and use them however you want! You will still need to go online to view your photos. You can also add fun borders and edit them. 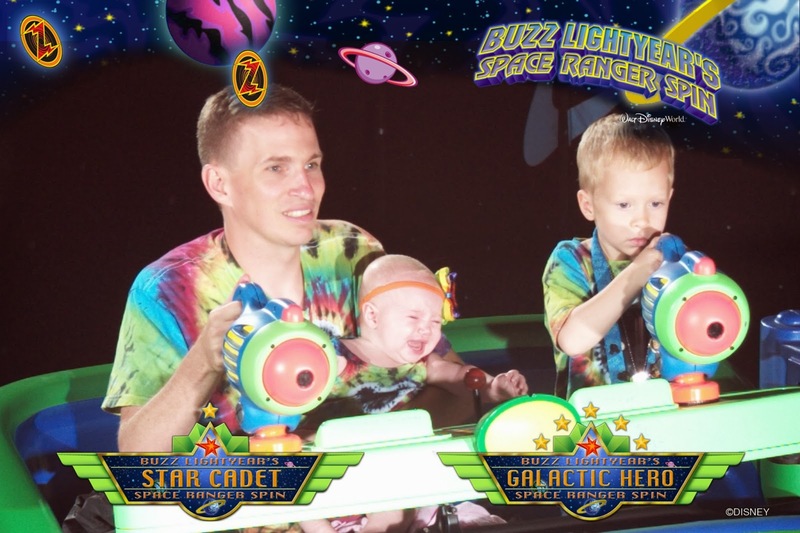 The Buzz Lightyear Space Ranger Spin photo here has had a border added. There is a time limit to order, usually 45 days. You can however, purchase a time extension if needed. Unlike the original PhotoPass, Memory Maker includes all the shots you have taken by photographers in the park, any and all on-ride photos (available at select rides only), and photos taken at character meals that include photography. You are also given the rights to print and use these photos however you would like (personal use only). While Disney does have a service where you can order a photo book or other items using your photos, with Memory Maker you can copy and print your photos via other vendors such as Shutterfly, CVS or on your home printer. A single on-ride photo, say of your son or daughter's first ride down Splash Mountain, will run you $14.95. A character meal photo from 'Ohana or Chef Mickey's will run you $29.95. Purchasing one meal photo package, one on-ride photo, and one family photo in front of the castle will therefore run you around $60. Suddenly that Memory Maker is sounding pretty good isn't it? Besides typical posed photos, photographers may surprise you with fun poses such daddy kissing mommy by the castle, and even "Magic Shots". Magic Shots are photos that Disney digitally enhances to add extra magic to your photo. One of the most common is Tinkerbell. The photographer may have you look surprisingly at your open hand and take the photo. When you see your photo though, Tinkerbell will have magically appeared! A Disney "Magic Shot". We have a visitor! While we never bought the basic PhotoPass, we have purchased the PhotoPass+ (now Memory Maker) on our past two vacations, and we have felt we have gotten a good value. 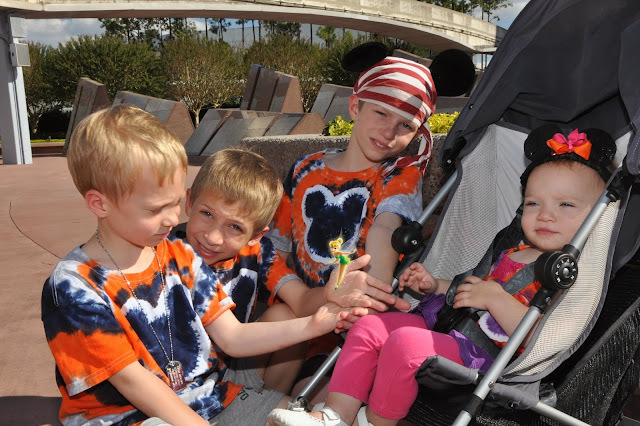 Especially if you will be going with a large group of family, will be going on rides that include an on-ride photo, you have reservations for meals with photography, will be doing Bibbiti Bobbiti Boutique or Pirates League, or will be doing lots of character meets with your kids, I think Memory Maker is a good deal. If you won't be spending much time in these areas, and are only interested in maybe that one family shot in front of the castle, than purchasing your one print might be better for you. While the two princess meals already include a photo package print in their prices, Memory Maker allows you to add the digital file for those photos to your account to be printed at home. For the restaurants that do not include the photo package in the price of the meal, our experience with PhotoPass + was that not only did they add the photos digitally to our PhotoPass account, but that they did physically give us the print package at the meal! While we have hundreds of photos from our most recent trip to Disney, I made a video showing some of our PhotoPass photos to give you an idea of what you will get if you choose to purchase Memory Maker/PhotoPass+. While this is not all of our photos its a pretty good selection of the various shots. I found the character interactions to be one of the biggest benefits of the package. Not only do you get the perfect posed shot, the PhotoPass Photographer often captures the entire interaction between the child and the character. One of my favorite Disney memories is when my daughter (17mo old) met Sophia the First. The PhotoPass Photographer did a wonderful job capturing those special moments for me, and I included them in the video. *** 7/25/14** Traveling with a large group? See my guest post on Memory Maker for Large Groups over on the MouseQuest Podcast Blog! Just discovered your blog while searching for info on Memory Maker. Adorable family! 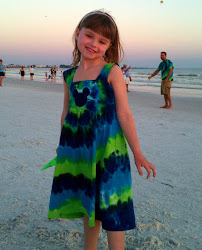 And I love the tie-dyed shirts. Thanks for the useful info. Thank you! We had a wonderful trip and hope you did too. Supertech Eco Village Noida is probably the finest in eco friendly services , but the best part of this township is that it is surrounded by eco friendly facilities. Do you know if you are staying off property and have the Memory Maker will they give you enough cards for all in the party? Like a magic band everyone has one but when it was still photo pass + they only gave one card per voucher. Thanks so much. My step son and his family were at WDW two weeks ago. I love all of the pictures taken were taken but they didnt get the picture of Tinkerbell in my granddaughters hand. Can it be done now with one that was taken there?